When I asked N what he'd like to do for dinner, he suggested we have tacos with lots of fresh guacamole. I love tacos so there was no arm-twisting necessary. 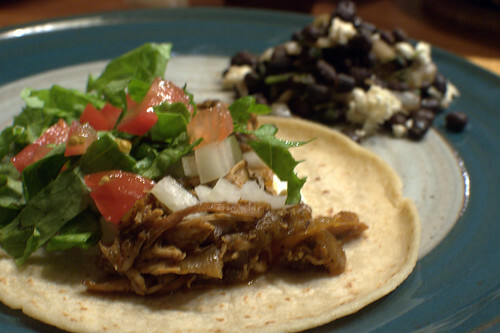 N offered to make his special shredded chicken if I would make the guacamole and prepare all of the vegetables. No problem. N seasoned chicken breasts then seared them on all sides in a grill pan to give them some extra flavor. Then he baked them in jalapeño salsa and salsa ranchera for about an hour or so. He pulled them out of the oven and shredded the chicken with two forks, mixing it up with the sauce (N said that the breasts shred easiest when cooked to 190-200°F). It then baked for about 30 more minutes. I also made some (super crazy simple) black beans as a side. I drained and rinsed a can of black beans, adding it to a saucepan with a diced onion, a tsp of cayenne pepper, a tsp of kosher salt, a few cloves of minced garlic, and a handful of coarsely chopped cilantro. I simmered it for just a few minutes to heat everything up and when I removed it from heat, I topped it with some crumbled cotija. Very simple but I enjoyed them. The guacamole is always just some combination of avocados, tomato, onion, cilantro, garlic, lime juice, and salt. You can't go wrong with guacamole! Two dinners in a row, we managed to play new games. I think this method of each person reading the rules individually beforehand helps us a bit. I like transit and travel themed games. 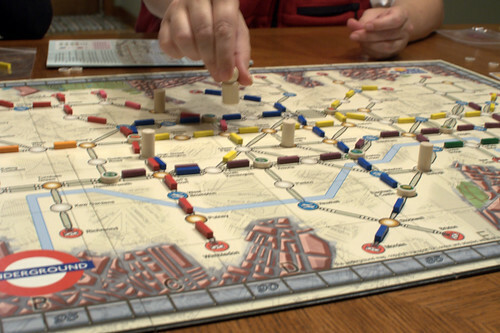 On the Underground has decent reviews on BGG, so I picked it up. It sure has a lot of pieces! I thought it was sort of fun, but it didn't seem quite right as we played. I looked up the rules questions on BGG afterwards and discovered that we misinterpreted a couple of the rules, so I think the game will go a bit more smoothly next time. The way we handled passenger movement was not correct. Thanks to being overrun by fresh fruit from my farm share, I decided to make apple spice cupcakes as well. I found this blog post of a Moosewood recipe. Rather than use apple pulp or shredded apple, I diced about 1.5 C of apple and used that -- I wanted chunks of apple in the cupcales. I also added a tsp of ground clove to the dry ingredients. Otherwise I made it as specified. I like them and have a stash at the ready in the freezer now. The plan was to have light(er) food - to try to play a new game while not in food coma. It sort of worked. Although we did not intend for N not to eat at all. Sorry! G is having a no-good-grilling-chicken year. 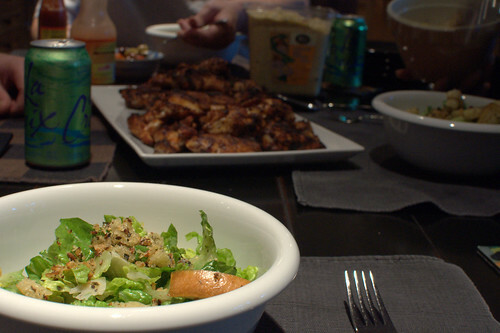 Olives + snap peas snacks, wings + salad, store bought potato salad, and watermelon. I am mildy amused that G and N like the exact opposite kinds of potato salad - Deviled Egg vs German. I like them both! Mmm. For the salad, I tossed some non-fresh bread and garlic spread leftover from when I made garlic bread and Wicked Shrimp, quickly in a hot pan to make garlicy croutons. (Note to self, don't forget fishies next time!) The wingz were our standard, with his spicy and her less spicy rub, and dressed (or not-dressed) with various sauces. Looking ahead, we will be serving non-chicken for the foreseeable future, Anything But Chicken. 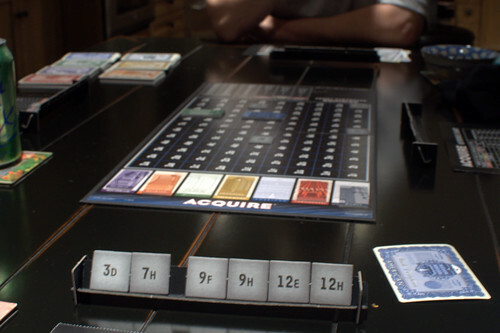 Then we sat down to play new to us Acquire BGG link. I knew G would like this game, and wasn't sure if N would. (And we are less picky than those two!) I think the each-person-read-rules-by-themselves method, look up clarification when necessary, worked out well for us. (vs reading rules outloud, or one person try to teach the rules). I can see your tiles J! N won, by a lot. I think we all enjoyed it! We will definitely play it again. Or perhaps revisiting some of the oldies but goodies longer duration games. Thanks for taking good pics! See you in a couple of weeks!